With so many things to do in one day, how do we ever manage to stay focused? Between school, career, extracurriculars, volunteerism, and family and friends it sometimes seems as though I'm spinning in circles. When there is work to be done, it is easy to get distracted by social media, chores, pets, or anything else. But, if you can focus on the task at hand, and not allow yourself to be pulled aside, you will get your work done quicker and more accurately. It’s easy to say, “stay focused.” But, how do you accomplish that? Here are ten ways to stay focused and get more done during the day. My number one tip is lists. To-do lists, work lists, personal lists, shopping lists, honey-do lists, and the list goes on and on. I can’t think of any occasion that a list isn’t appropriate. Lists keep your tasks and goals in the forefront of your mind. It helps you prioritize and, maybe most importantly, it allows you to see how much you have finished. Forget multi-tasking; it’s overrated. Simplify what it is that you want to get done and focus on just one task at a time. You will most likely cross it off of your to-do list much more quickly than if you were trying to do three things at once. Be sure to enjoy your work. If you feel as though your job is pointless or uninteresting, you will have a more difficult time keeping at it. Try to find work and projects that engage you and make you feel resourceful and important. Struggling to find your dream job? Check out this post for ways to find your career passion. Be realistic, both in the amount of work you expect to accomplish and how long you estimate it will take you. If you are rushing or trying to get something done, just to say it’s done, the quality won’t likely be as strong. Setting realistic expectations is key. Get comfortable. Make sure that your work area is clean and organized. Do you have a comfortable chair? A desk at an appropriate height? If your back is aching or your eyes are squinting from poor lighting, your productivity will suffer. Simple adjustments to your work area can have a dramatic impact. Stay positive. It’s easy to get bogged down with the difficulty of daily life. But, if you attack your workload with a positive attitude, it’s much easier to stay on task without your mind wandering. Undoubtedly, you’ll get more done in a shorter amount of time. Prioritize. There is no way to accomplish everything in one sitting. I love lists for this reason because it’s easy to number tasks and move some to the top, or bottom. Again, be realistic and choose to focus on what needs your attention most in that given period. Have a snack and increase your productivity and focus. Snacks can be distracting if you let them. But having some water and simple snacks close by can help keep you focused. You won’t need to get up in search of them and munching on something can be calming. Turn off your notifications. If you have a phone or e-mail system constantly pinging you, it is going to lessen your productivity. If every time a tweet comes in, you read it, you’ll be ten clicks and a half an hour later before you realize you need to get back to work. Set a time for checking emails and other messages, like at the beginning and end of your work time. Know when it’s time for a break. It’s not healthy to work too much, and you don’t want to become burnt out. Know your limits and when it’s time for a break, take it. This, in turn, will make the time you spend working that much more productive. When the extra-stressful, busy days hit, it’s easy for our vision of what is truly important to get hazy and blurred. That’s when it’s the most important to take the time to refocus and perhaps make that list to prioritize everything. When you lose focus, it’s easy to become distracted and overwhelmed. When that happens, try to zero back in on your motivation and your main personal focus. For each of us it may be different, but for each of us, it’s equally important. 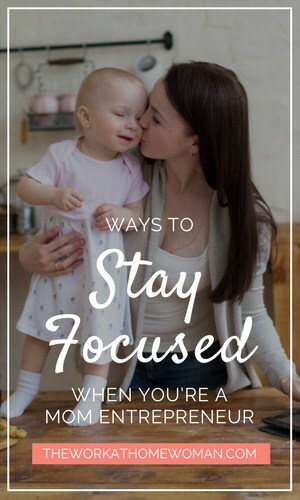 As a work-at-home woman, how do you stay focused? We'd love to hear your tips! Dawn Berryman is the founder of MarketMommy.com and Market Mommy:: The Blog, online marketing resources for mom entrepreneurs. Market Mommy shows moms how and where to market their businesses. She holds a B.A. from Indiana University and has worked in the marketing/communications field for more than eight years. She resides in rural Ohio with her husband and three young children. For more information, please see: Market Mommy. Originally published August 19, 2010. Content updated on May 3, 2017. These are all great tips to get more done online. When I first started my blog I was working 10-13 hours to per day. I really wasn’t focused, I was trying to multi-task and get too many things accomplished. It didn’t work, time flew by so fast that at the end of the day, I realized I actually didn’t accomplish anything productive. Now I make it a point to set quarterly goals for my blog. This helps me determine what I need to be working on in order to reach my goals. So I’ll spend time working on the important tasks, I call them A tasks. Once my A tasks are done, I’ll then focus on my other tasks. These can be tasks that can help me grow and are important. But not as important as the A tasks. I totally agree with you taking breaks. Now that I have an actual routine that I use for my daily blog tasks, I am working less time, but actually accomplishing a lot more than I used to. Plus I think it’s extremely wise to spend more time away from the computer. I love breaking away during the day and going for walks. This always helps me get a break and enjoy some quiet time. Plus it gives me more energy and gets me refueled to get more done online after my walk. Now if only I can remember to snack more often. I do snack, I just need to start picking healthier snacks. Thanks for sharing these tips, I know that if bloggers actually implement your advice, they will see huge improvements with their blogs. I know I did at least. Glad you enjoyed Dawn’s tips, Susan! Have you read the 12 week year? It talks about breaking your goals and year up into four quarters so that you can get more accomplished. It’s a great read! Thanks for stopping by! Thanks for sharing your tips for staying focused, Dawn. I do most of these things but taking a break is one thing I need to work on. I am getting better at it though. I get up and walk around more or do some light exercises at my desk. These are great tips I’d gladly pass along! Have a great rest of the week ladies! I am a huge list maker! I don’t know how to function without one! I have to remind myself of focusing on one thing at a time, thanks for the reminder. I love your honesty. It’s so true that the lists go on forever. It’s also amazing moms have the capability to pack an unbelievable amount of things in to one day! Just like you Dawn, my family is my first priority, but I have to admit that I allow my self to get all consumed with business ideas, blogging, social media sites, etc, that I slack off on my duties as a wife and mother. Thankfully my kids have ways of reminding me that I need to refocus! :) They don’t allow me to slide too far down that slippery slope! The guilt that goes with this “balance” of building a business, while raising a family is heavy. The typical guilt trips that moms go on. this one is followed up with a real quick…HECK NO! * “Will they hate me for being on FB, twitter, blogging, etc. However, the single biggest thing that never fails to remind me of what’s most important is when I am away on a business trip or away on vacation spending time with my children. It never fails that I re-adjust my priorities and refocus on what is truly important. I am building my business so that I can have more time with my family. Thus I need to stop and do just that! Where does the husband fit into all these lists? I’m with you on the Focus, Focus, Focus, but I’m also learning to Delegate, Delegate, Delegate.